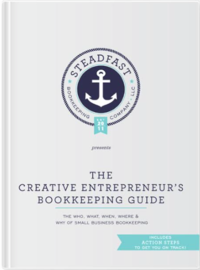 As a creative entrepreneur, handling your bookkeeping can be a blessing…Or a curse. When you’re on the ball, you save money and keep the IRS happy. But, when you get behind, it’s a tedious, confusing, time killer. The way someone manages your bookkeeping is important for the sustainability and scalability of your business. And as a creative entrepreneur, you produce wealth by generating new ideas, building relationships, and taking action. If all your time is spent organizing receipts, then you’re losing more money than what the books show (or will show once you reconcile). In this short post, we’re going to give you the know-how you need to choose a bookkeeper who is knowledgeable, trustworthy, and experienced. What’s your experience, and what type of clients have you had? First, look for someone who has proven experience in bookkeeping and only offers bookkeeping. As tempting as it might be, this isn’t a task your virtual assistant or business bestie should tackle. Just because you’re a small business, doesn’t mean you should hire small. Where do you want your business to be in 1-year? 3-years? How about 5-years? Will this bookkeeper up for the ride? Can they give you the tools you need to grow financially? And, don’t stop with experience. Someone who managed the books of a local law firm may not be a good fit for your creative business. You want someone who can understand your journey, from struggling startup to a now thriving brand. What’s your educational background and how do you stay up-to-date in your industry? Your bookkeeper will do more than setup your Quickbooks account. They stay one step ahead of the game to advise you on budgeting, policies, and ethics. They can also offer cash flow analysis. So, work with someone who has a formal accounting education and stays current on new technology and procedures. For example, we use Quickbooks online and while anyone can learn how to go from screen A to screen B, we understand the why behind it. It is data entry, but we ask what would be best for This. Particular. Business. Bookkeeping is like social media marketing. You can’t post one day and then walk away. Well, okay, you could, but that won’t get you any leads. Instead, you engage with your audience, provide consistent content, and monitor insights. Your bookkeeper shouldn’t set it, and forget it either. They should engage with you to review transactions, identify areas of improvement, and discuss next moves. In short, take the time to make a list of what characteristics, credentials, and experience you want to see in your bookkeeper. You’re a creative entrepreneur and you know you’re ready for more than a DIY, cut-the-corner approach. Asking these questions will make a world of difference when it comes to your experience working with a bookkeeper.